Houses are at a disadvantage when it comes to external noise because, unlike townhouses and apartments, all sides are exposed. 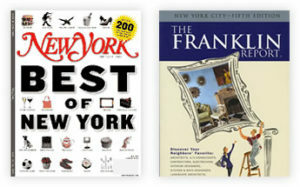 Being at street-level means the traffic noise has just a short distance to travel before it enters the home. Some people are particularly annoyed by the transition from a quiet street to one with a rumbling truck passing through. Even if there’s available space, fencing and landscaping can accomplish only so much against noise. Neighbor noise can also be quite annoying especially since neighbors are likely to take on tasks like landscaping on the weekend which is exactly when most people are looking to relax. For example, 50 feet from a leaf blower the noise level can be 70-75 dB. That distance could easily reach in past your window from either side of your home and even from across the street. To notice a reduction in noise levels, a soundproofing effort needs to a result in a 5-decibel improvement. While such a decrease is noticeable, it often isn’t satisfactory. Not until there’s a 10-decibel improvement is the improvement sufficient considered beneficial. For reference, closing the windows in a room produces a 10-decibel improvement. Other than obvious holes in walls and cracks in framing, doors and windows are the top offenders when it comes to allowing noise to enter a home. 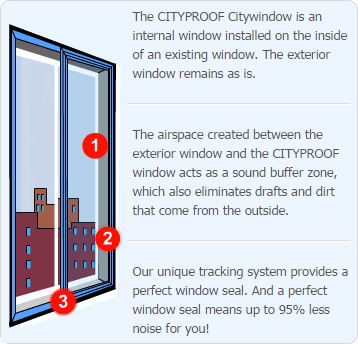 Cityproof’s soundproofing solution can be applied to all of the windows in your house without changing the exterior appearance and with practically invisible changes to the interior.